This can be really handy. 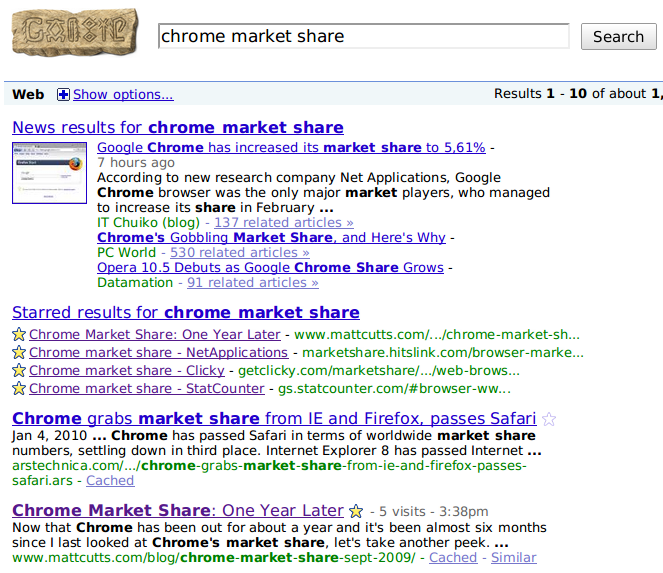 For example, at the start of every month I do the search [chrome market share] to bring up this blog post I did so that I can find the links to the three metrics services. But now I have those services bookmarked and I can access them right from the search results. Good stuff. Is this connected to Buzz in anyway ? like, showing a msg in the buzz timeline of the user “I starred one result” or something similar ? I think it’s a great idea to have search results bookmarked! I’m using Google Bookmarks more after this launched. I think the new star option in Google search is a great change, but it makes me wonder even more why Google Chrome isn’t integrated with Google Bookmarks? What I want to know is when Google Bookmarks will be integrated with Chrome’s bookmark sync. Perhaps I noticed the * a few days back. Google is adding features, always innovating. Re. Google ‘Stars’ – For those of us that like their Google ‘clean’, how do you turn OFF Google Stars? I already have SearchWiki ‘hidden’ in my Search settings but this doesn’t work with Google’s SearchWiki replacement!?! This is pretty cool, actually. I’m conducting a good number of “repeated” searches like in the above example every month. One more feature which will help me to save time and stay more organized. Care to mention if this feature has any effect on organic rankings? Seems like the data collected could be used to provide useful results for others users. Great idea, just like “starring” an email in GMail. Bueno. I applaud. With this Google is providing a flexible way to people to ing the web content they want.The finest thing is they are easily organizable. Liked Them. I’m up for any method that saves time when searching- if it allows you to categorise items, even better. What a cool idea. I hate having to go through all my favourites to find the right website. This will save me a few seconds which adds up to hours by the end of the month! Thanks Matt, do you think there will every be a way to track that your site has been ‘starred’ through analytics? @Tim, Good question! It would be nice if we can track this like the positions in Google Analytics with advanced filters, http://www.websharedesign.com/blog/display-search-engine-rankings-seo-in-google-analytics.html. Unfortunately this doesn’t fully work in The Netherlands. I appreciate Google for this update on “Star Bookmarking”. I have been using this and it works fine and vote for this. I tried using Google stars for my blog posts and love how it separates from the other search results. Also saves a lot of time having to manage finding certain information twice. Great post, I have added you to my blog as a list of top ten bloggers on the web…http://www.jasonverdelli.com. The star feature is good and useful. Also it is simple and elegant; it makes you wonder why it did not happen sooner. I do think Google should let people turn it off if they do not like it. This will help me out a ton on the long list of bookmarks I have. Since I often times have trouble finding a bookmark out of the ever growing long list I have, This saves me a ton of time. Google, as always you just keep making things easier! Thanks Matt! This is a nice option for those sites we wish to look back up that sink in the rankings for whatever reason. Just out of curiosity… if everybody is starring a particular site, will it show up higher in the search engine rankings for somebody searching for the first time? In other words… popularity rankings? Thanks for these links Matt. I got side tracked from using Chrome but will give it another try. What if down where the page’s file size used to be there was some metric that displayed how many times people starred it? Maybe a calculation that takes into account search frequency of the key term and the number of people that starred it. And if 1,000,000,0000 people hypothetically starred a website, would its natural rank also increase? Lastly, does google plan to support this feature past 2012? I like this notion quite a bit, and will be on the look out for ways to leverage it. Like being able to send a link to a set of starred results or something. While I quite like the starred results – I have my own sites in my Google Bookmark list, and when I search for a related term, my sites appear in the Starred results – Great, but when I check my sites’ stats in Webmaster tools….they show as being returned in the top 2 or 3 SERPS for those keywords , which is obviously very unhelpful. Will this bug be fixed? Also, (time for a cheeky request, now I’ve helped you..!) do you think you could look into my site, and see why it is penalised? I have no idea what I have done wrong (well, I think I do know, but I fixed it some time ago, and it won’t happen again). I notice that a bookmark came up at the top, thanks for explaining why. I am certainly not following the crowd with this new feature. This new feature Google is offering is very disappointing. Has Google ever heard of Bookmarks? A company who prides themselves on simplicity seems be just cluttering their search. What disappoints me the most is the fact that this will once again be a push back on new and undiscovered websites. A feature you should be offering is a list of new sites based on the keyword search. While it is difficult to say how Google would go about doing this, it would actually offer a new dynamic to Google search. A way for undiscovered sites that are continually stuck in 5 page + category a chance to move up. Gotta love extra features. Bookmarking can be an absolute nightmare, especially when looking for old bookmarked sites. Shame about Chrome though, it’s a rocket for browsing but does leave a little bit to be desired on some things. Still it’s early days for chrome and I’m sure it’ll come good! Will it be shared with others in future, I mean as wiki? Well the Google star is a new facility & I don’t use it often. But the Google bookmarks facility is fantastic as I change operating systems all the time. Some times I’m with Ubuntu but after a month wanna use Ms Windows and then after some time wanna give Solaris a try. So I don’t need to backup my bookmarks as I can access them from the google toolbar anytime and anywhere I want to. I don’t like it! I dont want to highlight bookmarked sites, though I can see it’s useful for some, but when you have a massive db of bookmarks I think it makes a mess of the results by putting them at the top of the page. I do like the staring as a way to book mark, but as a marketer if I want to see where a site is ranking on the first page I have to log out of my google account to see acurate rankings, and not just sites I’ve stared. Is there a toggle option where I can turn off those from showing up? That’s a good improvement for Google Bookmarks. It just sounds strange (to me, at least) if you consider that Chrome synchronizes its bookmarks with a completely different collection (Google Docs). Great idea, just like “starring” an Email in GMail. But when you have a massive db of bookmarks I think it makes mess of the results by putting them at the top of the Search Page… !!! This is just another feature of why 72 percent of America, and just about the rest of the planet uses google for searches. Google provides some of the best, user friendly tools for consumers. I actually love the bookmark feature … Bookmarks easily get lost so always good to know you have other options to keep track of them. Not as much as I love Chrome, but still love it all the same. Google stars are dead handy when bookmarking, quite pleased with them. This is dangerous!! I searched for my bank home page on Monday. On Thursday, I searched for it again. The Google starred item displayed my bank account login name and password!! How do I dump “stars”? Its a nice tool i think. you will always get the best results.